You can check out this information guide for any specific instructions for using Xero (NZ) in Tanda, including setting up the integration, importing staff and exporting Timesheets. Your user account must be a Payroll administrator. Go to Settings > General Settings > Users, choose your name, ensured the Payroll Admin box is ticked. Employees have been added to Xero with a Phone Number and Email so this imports into Tanda (for sending out Rosters). A pop-up will then display asking you to login to Xero (if you're already logged into Xero in another tab, you'll go straight to the authorise screen). Enter your login details for Xero and click Login. Who the integration applies to: All staff by selecting Everyone or Default Locations and then selecting a Location (if you haven't set this up yet you can come back into here later). 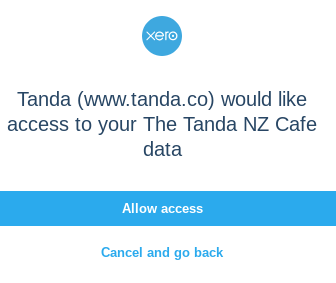 This is used if you have more than one Xero account connected to your Tanda account, you need to match a Location to a Xero file. Under the Xero Settings heading, you can specify Tracking Category details. You can also select how you want Tanda to handle new staff. If you have enabled to Automatically import new staff profiles, when you add a new employee to Xero, Tanda will automatically import this within the hour. Only new employees will be imported and existing profiles updated. If you make any changes just click Save at the bottom. Click on the Xero organisation name to select the Integration. If you only have one file attached to Tanda, you'll just see one box however if you have more than one just click on the one you want to import from first. Next, you'll see a bar loading to show your staff are being imported, depending on the amount of staff you have this can take a few minutes, so just stay in the screen. If any staff didn't import, check their details in Xero to ensure you have added them, they have a current start date and don't have a finish date. Your staff list will now show under Workforce > Staff. Add the employee to Xero and if you have enabled to automatically import new staff, in your Tanda Xero integration setup, Tanda will automatically import this employee within the hour. Add the employee to Xero and you can force this update to happen immediately by going to Workforce > Staff > Add Staff > Import from Xero. Only new staff will be imported and existing staff updated. Use Employee Onboarding: this sends the new employee an App to fill in their details and a profile will then automatically be added to Tanda and Xero. If there are any that are showing white, just click on the employee's name to go into their Timesheet to check for any shifts you haven't approved. Your Timesheet information will then go over to Xero. Depending on how many, this can take a minute or so. Once it's completed you'll be taken to the Results Confirmation. If you didn't have any errors, you can go to Xero and go to Payroll > Pay Runs and process as normal. If you did receive any errors in Tanda, check for the tips to see if you can solve it and then try re-exporting.